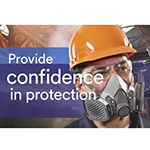 "Using a respirator filter too long can lead to break-through of the hazard into the respirator"
ST. PAUL, Minn.--(BUSINESS WIRE)--Using a respirator cartridge beyond its service life can endanger workers and lead to regulatory violations. 3M has launched a new line of organic vapor respirator cartridges with 3M™ Service Life Indicator technology, an end-of-service-life-indicator (ESLI) that, when used in appropriate environments, visually shows when users should change cartridges. The 3M™ Service Life Indicator can be used to complement a company’s current respirator cartridge change schedule, and in some cases replace it. Workers simply peel back a removable sensor protector to view the indicator bar and, in appropriate environments, determine when to change the cartridge. The indicator can also help optimize cartridge change schedules across workers because it is designed to indicate service life based on individual exposure and breathing patterns. 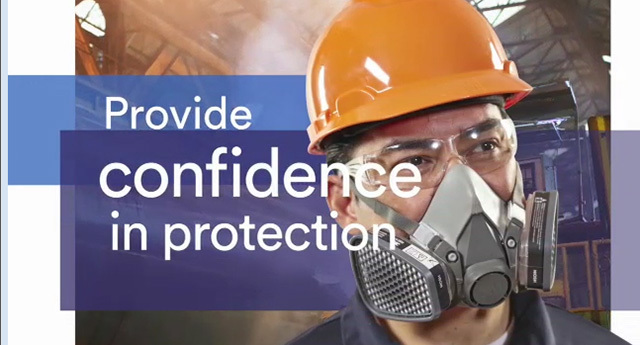 3M offers a comprehensive, diverse portfolio of Personal Protective Equipment (PPE) solutions providing respiratory protection, hearing protection, fall protection, reflective materials for high-visibility apparel, protective clothing, protective eyewear, head and face protection, welding helmets, and other adjacent products and solutions, such as detection, monitoring equipment, and active communications equipment. Visit www.3M.com/PPESafety or http://m.3m.com/PPESafety. 3M has launched a new line of organic vapor respirator cartridges with 3M Service Life Indicator technology (ESLI) that, when used in appropriate environments, visually shows when users should change cartridges.